Last week we told you about our Gallery Bookmarklet and hopefully you’ve been on the hunt to add images to grow the FontShop gallery. At the end of each month we’ll be highlighting a couple of images we like from the gallery, so make sure to keep those finds coming! This week we move away from Web FontFonts in the design world and into the realm of pop culture – specifically the use of FF Enzo Web over at Impose Magazine. We were definitely impressed at the use of multiple weights to add some gorgeous nuances to the site. 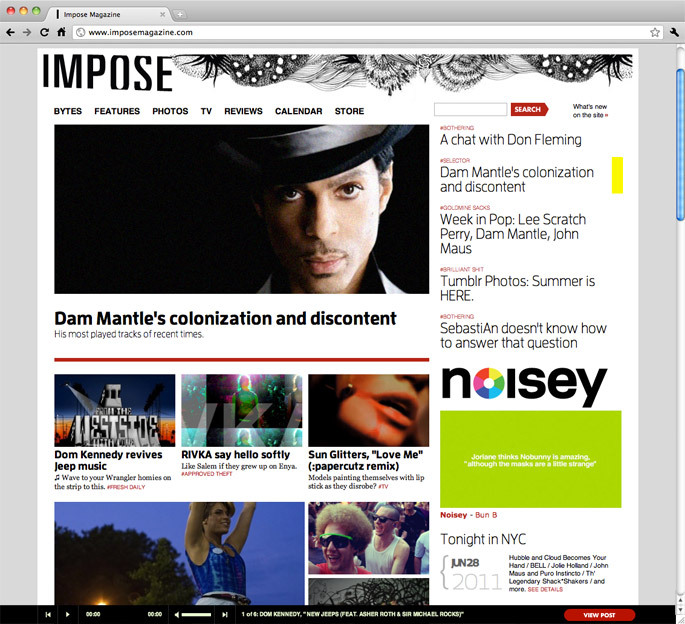 The mix of thin and bold makes the site really “pop” to the culturally-inclined reader. Do you have any favorite sites employing Web FontFonts? Suggest them in the comments. We love new fonts. 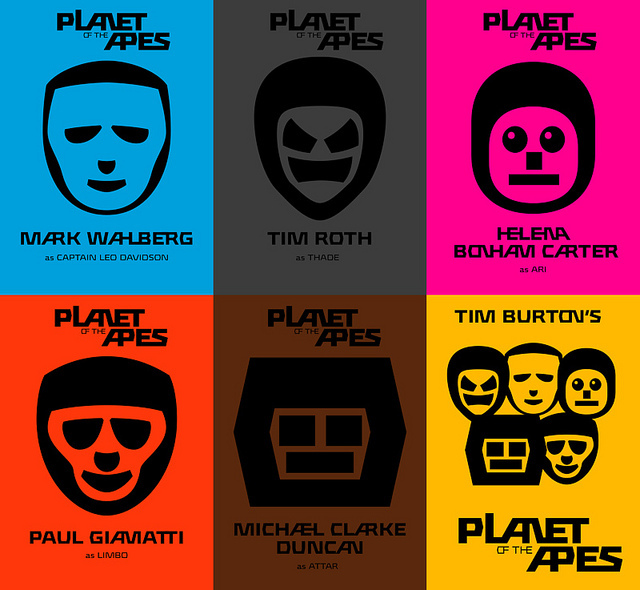 Earlier this month we showed off new stuff from DSType, Typolar, and Red Rooster. In case you missed it, or for some oddball reason aren’t subscribed to our newsletter, you can subscribe and check out old announcements in our Newsletter Archive. Acta, from DSType, was just one of many new releases thus far in June. Download Acta PDFs: Large (4.2 MB) and Small (446 KB). Because we’re greedy for new fonts, and because there’s still a whole two days left in June, we’ve just gone live with another update. Check out what’s new on the New Fonts page for June. Among them comes the new superfamily from Font Bureau and Cyrus Highsmith: Salvo. We’ll be looking at these new releases more closely in our next newsletter. We know you’re busy and the Internet is a crowded place, so we’ll try to give you a little reminder on Fridays of what’s going on out there. Below please find five recent FontShop-related threads that you may have missed. 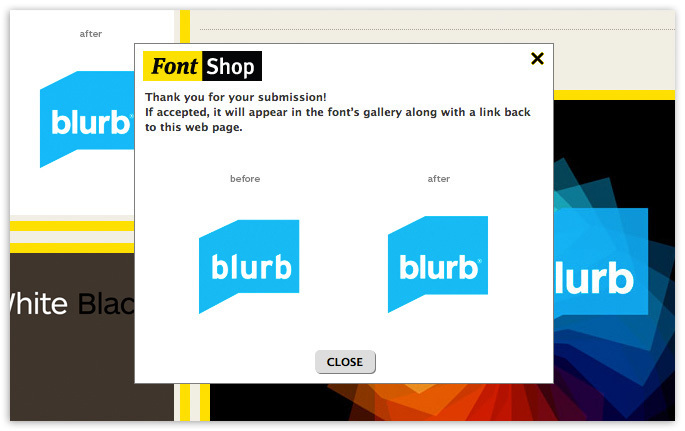 Did you know you can help grow the FontShop gallery? Check out how here. We’re loving the hidden glyphs in designer Łukasz Dziedzic‘s creations. In last week’s Webfont Wednesday we reviewed the The Chicago Manual of Style Online and this week we take a look at the equally gorgeous print edition, using FF Tisa. 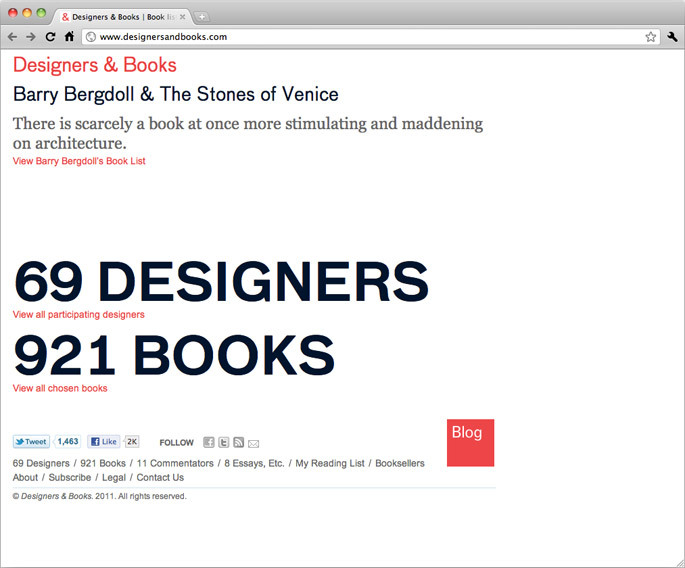 This week’s Webfont Wednesday examines Designers & Books‘ use of FF Bau Web. Yves Peters tackles the many disappointing summer blockbuster posters, and the few hidden gems, in this month’s Screen Fonts. 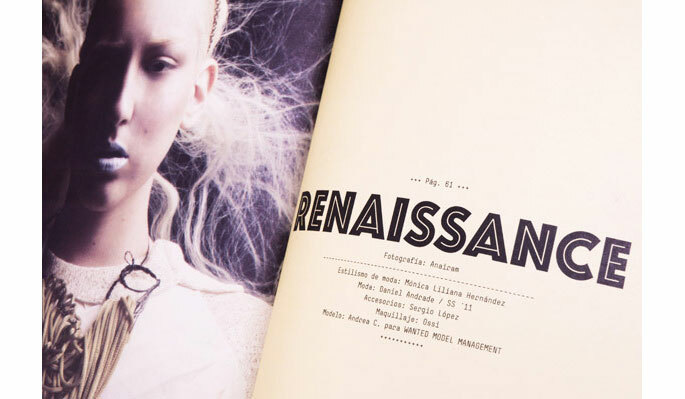 In most type design, a bit of the designer’s personality is imprinted on the design. This might show through in certain characters, the way they treat their terminals and tails, the way each character interacts with the next. And sometimes the imprint is a little more… direct. A little while back, we here at the ‘Shop were admiring the new FF More by Łukasz Dziedzic. As we were exploring the character set to see what sort of interesting glyphs could be highlighted in the newsletter, we found this charming fellow. You’ll sometimes see a foundry’s mark as a glyph in each font, and occasionally a seemingly unrelated dingbat will make an appearance. But this masked character seemed unique, and we wondered: is he hiding in all of Łukasz’ designs? We jumped over to FF Clan, one of my personal favorites. And we were delighted to find, buried deep in the character set, an entirely different masked face. Even more intrigued, we searched through each of Łukasz’ other typefaces: FF Good, FF Mach, and FF Pitu, and sure enough each design had its own little avatar, each with their own personality befitting the typeface. Head over to Adam’s Flickr page for more excellent work. Also check out this diagram on FontFont’s Flickr page, which shows every weight variant of every masked floating head from Łukasz’ families. We can all agree – there’s a lot of Internet out there. Just a short time browsing, and your eyes will take in many examples of the thousands of fonts at FontShop.com alive on sites. We know webfonts only represent a small segment of typography on the web. There are images of digital type samples, rendered type, and of course photos of fonts out there in the real world. We do what we can to spot these and put them up in the FontShop Gallery. If you’re not already, you’ll be prompted to log in. Once you’re all set, you’ll see a button for our gallery bookmarklet. Just drag to your toolbar to add the bookmarklet to your browser. Then comes the fun part! 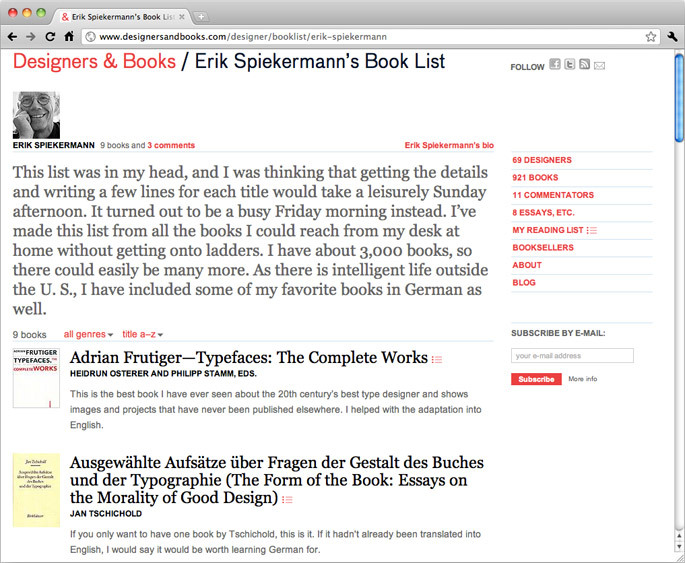 Next time you’re on a website and spot a font in the wild, click the bookmarklet. It will automatically highlight available GIFs, PNGs, or JPGs. Select the one you’d like to submit and tell us a little about why. Images are sent to our staff for approval and we publish the best submissions daily. Once your image has been approved and categorized, you’ll see it on our gallery page. You’ll also see it on the gallery page for the particular font you spotted, under the Gallery tab on every font page. Have you used the bookmarklet tool? Leave your feedback in the comments! In our last installment of Webfont Wednesday we looked at the supporting website for one book. In case that got you thinking about expanding your reading list, this week we’d like to direct you to Designers & Books. Not only does the site recommend almost 1,000 books, from dozens of respected designers, but the headings and subheadings on the site are simply and beautifully set in FF Bau Web. Enjoy building your reading list! 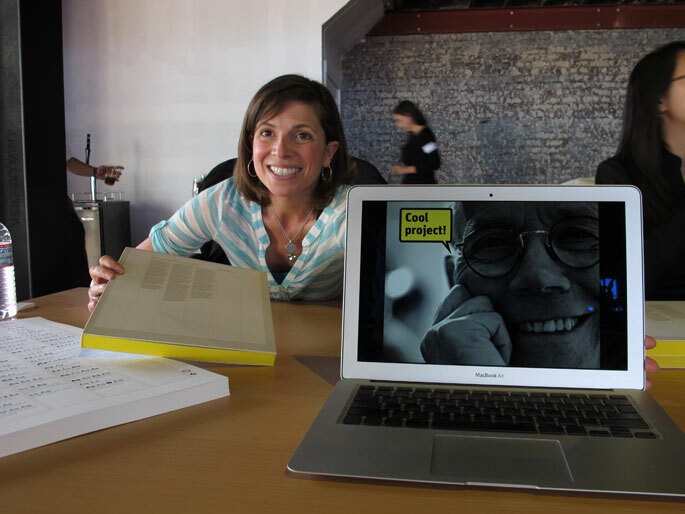 Last week we showed you The Chicago Manual of Style Online, which uses FF Tisa Web throughout. We like what they’ve done so much that we had to pick up the ol’ bound and printed copy of their 16th Edition. As you might imagine, the book is entirely set in FF Tisa (OpenType). The designers of the book over at The University of Chicago Press made full use of the typeface: the range of widths, small caps, and figure variants all contribute to an incredibly clear and aesthetically pleasing design. The 15th Edition of The Chicago Manual of Style, coincidentally or not, also featured a FontFont stalwart: FF Scala and FF Scala Sans. The 15th Edition’s vibrant orange was used as an accent on the soft blue cover of the 16th Edition. You can pick up a copy of the 16th Edition here. The FontShop staff readies for summer by compiling a fontlist for you. We were thrilled to host the book launch for Explorations in Typography this week. 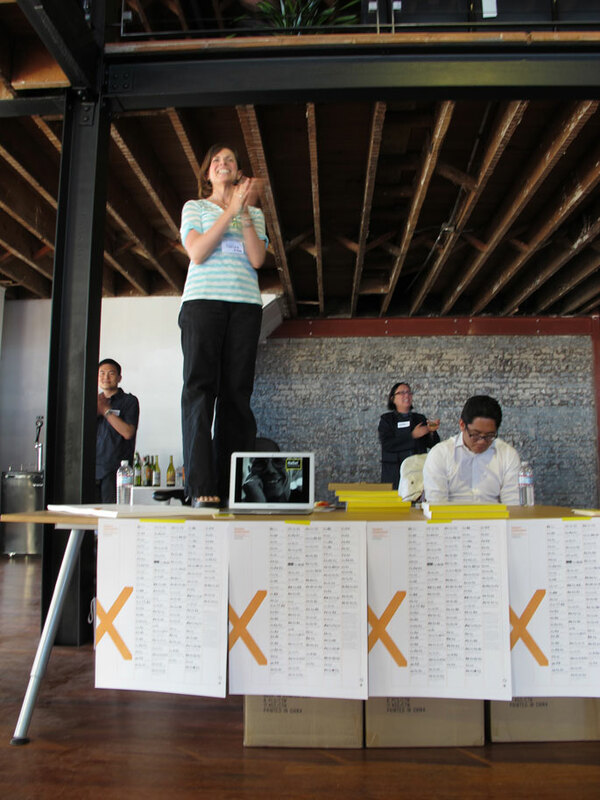 Check out our recap here. Did you miss our latest newsletter on Wednesday? Read it here. Then check out the new fonts from DSType, Typolar, and Red Rooster. You can subscribe to newsletters on this page to get this font deliciousness in your inbox twice a month. 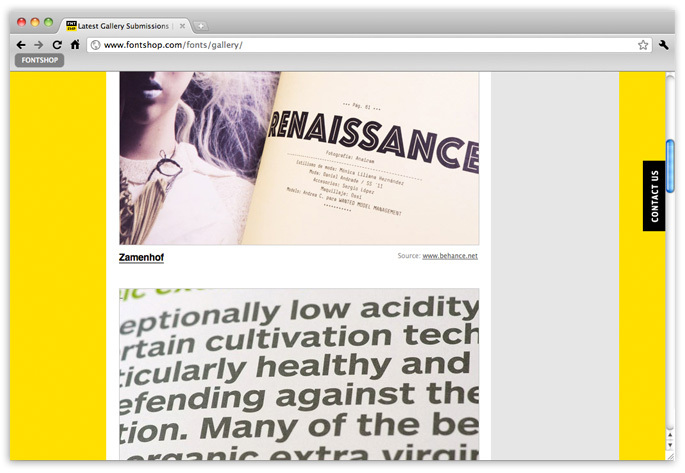 A flurry of posts on The FontFeed this week, including a review of Typography for Lawyers and a preview of Type]Media11. Part Two of our new series takes a look at the Chicago Manual of Style. Last night we at FontShop’s San Francisco office were thrilled to host a book launch party for Explorations in Typography: Mastering the Art of Fine Typesetting by Carolina de Bartolo and Erik Spiekermann. Carolina was in attendance to sign copies hot of the press and brought Erik along…sort of. The party was held as part of AIGA Design Week in San Francisco and drew a great crowd of designers and type aficionados. 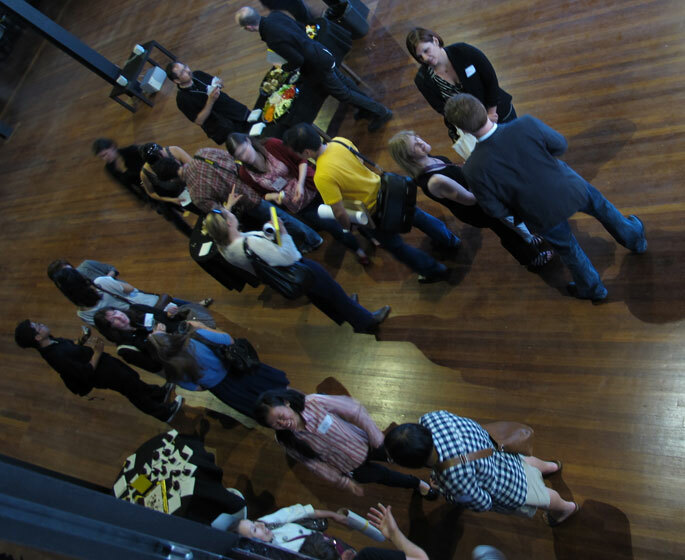 We were excited to host the first event held in the newly renovated space at the historic Storek Building, a technology arts building in the heart of SoMa. And what’s a party without cake? Not to make you jealous, but ours was delicious! 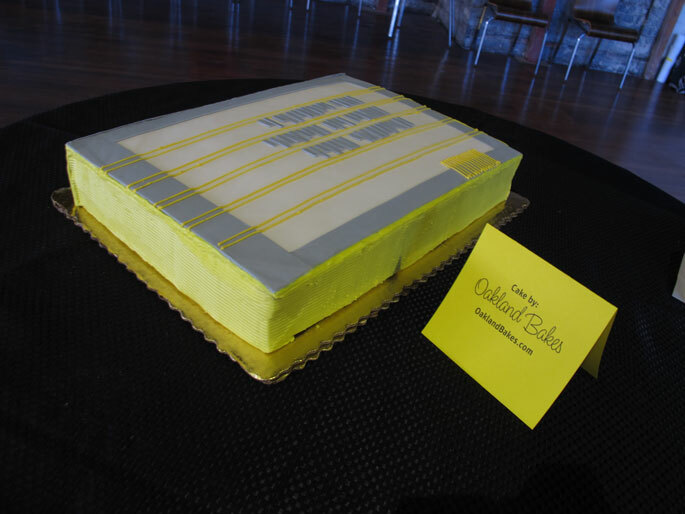 And Oakland Bakes did a fantastic job making it look EXACTLY like the book. Aaron’s June pick is Refrigerator Deluxe by Mark Simonson. The beginnings of this design date all the way back to 1988, inspired by vague memories of block-style lettering from Mark’s youth. As time went on, additional styles and alternate glyphs were added, leading to its Deluxe release in 2008. While the basic block-style lettering remains by default, Refrigerator Deluxe can transform into a stylized Art Deco face, both with squared and open shapes, with the flick of an OpenType feature. This User Guide gives a great overview of the available glyphs and features, and how to access them in various applications. Download Refrigerator PDF Specimen (152 KB) and User Guide (41 KB). One of my own picks for this month, Xavier Dupré‘s FF Sanuk is deceptively buoyant: its squared veneer gives way to a calligraphic flare. Take the lowercase ‘k’, for example — the foot tails off in a friendly way that you might not expect upon first glance. FF Sanuk has perfect form and character for the web, and was recently released as a Web FontFont. Download FF Sanuk PDF Specimen (545 KB). Theresa chose a blast from the past: Blockhead Alphabet, a classic display face from John Hersey and Emigre. One of my earliest lettering memories as a child is the pride and sense of accomplishment I felt when I discovered how to make letters look three-dimensional. (Of course, this meant that every time a class project required a poster or some other visualization, I had an extra task.) Blockhead Alphabet is reminiscent of that childhood discovery, right down to the details of imperfection. Though “good design” and “term papers” don’t usually cross paths in our train of thought, the web designers for the Chicago Manual of Style clearly saw a relationship between the two. The result is a clean, crisp website set in FF Tisa Web and complemented by an inviting, cheerful color palette. The site is a companion piece, rather than a mere “footnote” to the printed guide, which is also set in FF Tisa. Although we aren’t too particular about citations on this blog, we couldn’t help but cite this site for Webfont Wednesday! 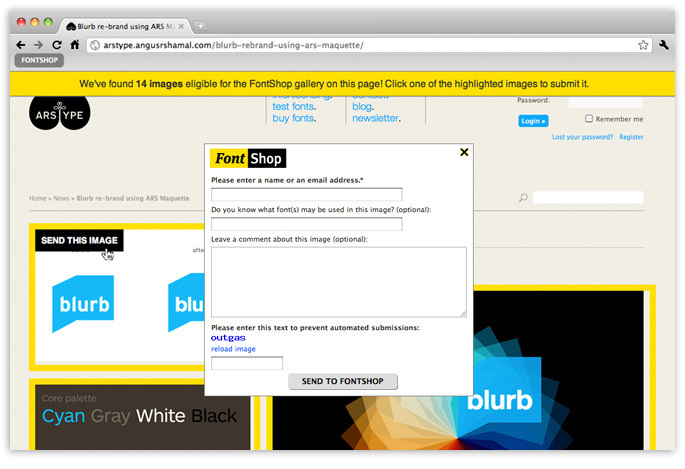 We take a look at what Steve Jobs’ Lion announcement means for Web FontFonts. Want to preview those site updates you’re going to make? Take a look at the expanded Web FontFont selection on FontFonter.com. We were so excited about webfonts this week, we decided to start a weekly series to highlight them. Yves Peters interviews Jason Smith to get an inside look at this London-based foundry. The FontFeed reviews several dozen albums in this month’s My Type of Music. Almost a year ago, we first announced FontFonter, a tool which allows you to temporarily replace sans and serif fonts on almost any website with a selection of Web FontFonts. Since then, FontFont has greatly expanded its Web FontFont selection, and that expansion has carried over to FontFonter: you can now preview over 40 Web FontFonts, ranging from trusty standbys like FF DIN Web, to some of the newer designs like FF More Web and FF Sanuk Web. 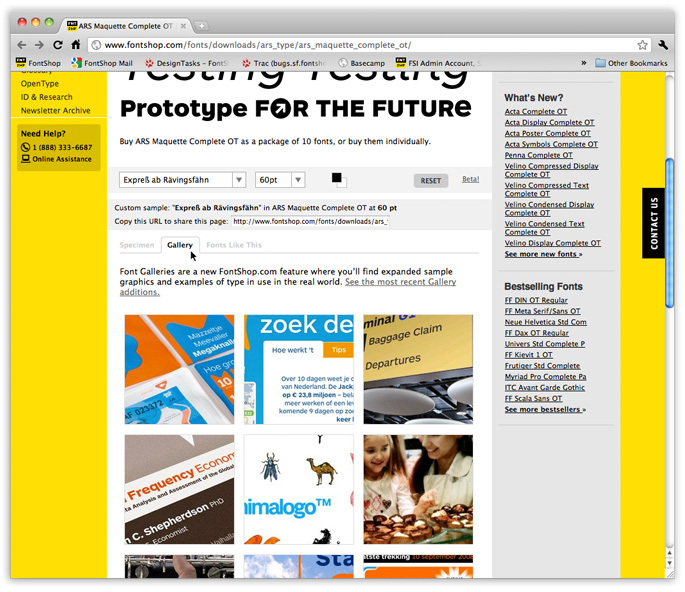 The process is simple: Go to FontFonter.com, type in a website URL, and FontFont It! You’ll then be able to specify which Web FontFonts you want to preview in a control panel at the top of the page; below will be the website you entered, with the chosen fonts replacing the default fonts used for that website. You can choose to replace all fonts with a single Web FontFont, or you can specify replacements for sans and serifs, respectively. This has certainly been an exciting week in Webfonts here at FontShop. Not only did we we get giddy at the WOFF support announcement for Lion, but we also rode the buzz around Azuro Web into the final hours of its 90% off promotion. The discount may be over, but you can still purchase this typeface, optimized to achieve the best possible legibility on screen. With visions of beautifully designed websites dancing in our heads, we decided to launch a new series here on the blog called “Webfont Wednesday.” Each week we’ll highlight a site using Web FontFonts in this space. Though our staff is spotting them out in the wilds of the internet, please feel free to share your designs in the comments section, on Twitter using hashtag #WebfontWeds, or on our Facebook page. This week we’d like to point out an I Love Typography post on the recent TYPO Berlin conference. Not only was it wonderful to read Dan Reynolds’ detailed synopsis of the presentations, but what a gorgeous presentation using FF Scala Sans Web for the headlines and the FF Scala Web for the body.